If you missed the book giveaway yesterday, you still have time to enter! 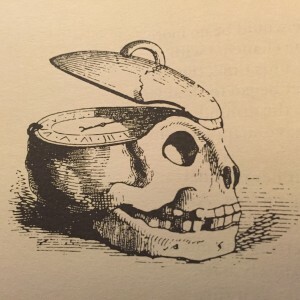 Today's spooky text and images come from the folklore collection Legendary Connecticut: Traditional Tales from the Nutmeg State (1984) by David E. Philips of Eastern Connecticut State University. "Just inside the entrance to the sprawling Evergreen Cemetery in downtown New Haven, a massive, modern-looking, pink granite tombstone stands in marked contrast to its smaller, grayer, Victorian neighbors.... Upon a polished, elongated oval covering most of the otherwise rough-hewn marker is carved this cryptic story: AT HIGH NOON/ JUST FROM, AND ABOUT TO RENEW/ HER DAILY WORK, IN HER FULL STRENGTH OF/ BODY AND MIND/ MARY E. HART/ HAVING FALLEN PROSTRATE:/ REMAINED UNCONSCIOUS, UNTIL SHE DIED AT MIDNIGHT,/ OCTOBER 15, 1872/ BORN DECEMBER 16, 1824. In larger letters, cut in bold, black relief, curving over the top half of the oval, appears the haunting proposition that THE PEOPLE SHALL BE TROUBLED AT MIDNIGHT AND PASS AWAY." "Of all the legends about Midnight Mary which circulate today in oral tradition, probably the one most widely-known recounts a tale of live burial. It has been reported that not only New Haven youngsters and area college students -- the most numerous bearers of the Midnight Mary tradition -- have kept the story alive, but also that older residents of the Winthrop Avenue neighborhood where Mary Hart lived have been active in perpetuating the legend. According to those who know 'the facts,' Mary E. Hart did not have a 'shock' on that October day in 1872, but was struck down by a rare disease, undiagnosed back in those times, which gave its ultimate victims only the appearance of death. Blinded by grief and apparently convinced by midnight of the same day that Mary had indeed departed, the family called the undertaker in and he hastily went about his funereal work, including burying her body at Evergreen Cemetery. 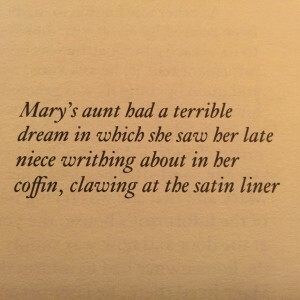 "During the night following her internment, however, Mary's aunt had a terrible dream in which she saw her late niece writhing about in her coffin, clawing at the satin liner and moaning piteously for help. Could a terrible mistake have been made? Was her beloved Mary, in fact, still alive? It did not take long for the family to check on the validity of the vision. They ordered the grave reopened and the coffin removed for inspection. When the heavy lid was finally raised, a ghastly sight met their eyes. Mary was now unquestionably dead, but it was also plainly evident from the grotesque position of the body cramped in the agony of struggle, that her death had been hard -- and very recent. To cover their mistake and ease their anguish, the story concludes, the family erected the magnificent monument with the weird warning and plausible but false death story inscribed on it." I hope no one in that family ever read Poe. Thank you so much for that link! Great stuff! I like that final image. I'm glad you liked it! I thought it was wonderfully creepy. Spooky story and chilling tombstone! Reminds me why Poe's THE PREMATURE BURIAL scares me so! Yes re: Poe! That was my thought exactly!